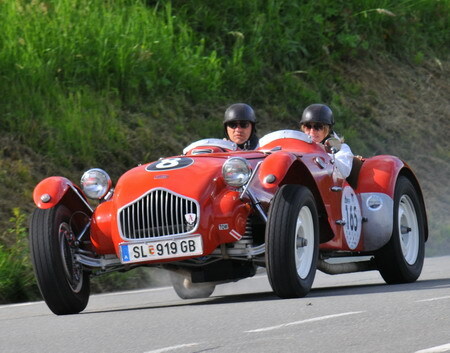 We just received word that Allard J2 1575 is coming onto the market. This car was originally ordered by "Mr. Hyde" through Nunns, a UK dealer. It was registered as BJV 365 and equipped with a Mercury flathead and for 3-speed. The car was originally painted steel gray with black interior. Mr. Hyde then sold the car to Mr. Hill, who then sold it to Dr. Tom Turner. The late Tom Turner was a noted Allard enthusiast who owned a number of Allards...in addition to publishing the Allard Register. Tom restored this car to be his personal race car which he, and then his wife Yvonne raced from the early 80's to the mid 90's. According to the current owner, the remains in the same condition as it was owned by Dr. Turner. The asking price is 222,222E /177,488GBP / 286,755USD. Click here to contact the owner. The car is currently located in Salzburg, Austria. PS: Tom Turner received permission from Fred Wacker to use the 8 Ball livery.